"Sampath Speaking" - the thoughts of an Insurer from Thiruvallikkeni: IPL - apple Tim Cook in India - who will move to next round in IPL !! IPL - apple Tim Cook in India - who will move to next round in IPL !! IPL is drawing to a close - Home advantage counts. With four spin options to call upon on a parched Eden Gardens pitch, Kolkata Knight Riders strangled Sunrisers Hyderabad to defend 171 and pull off a 22-run victory. The win helped them secure a playoff berth, while ending Mumbai Indians' journey in the tournament. Sunil Narine delivered his most incisive bowling spell of the tournament, with figures of 3 for 26 in four overs. His partner in crime was Kuldeep Yadav, the 21-year-old chinaman bowler who had replaced Piyush Chawla in the Knight Riders XI. Miles away, Democrats knew a general election battle between Hillary Clinton and Donald Trump would be rough, but many never considered the potential of a nailbiter. Last week, Indian Nation was abuzz with actitivy. Five Assembly elections, and five different winners. Voters have not distributed their favours equitably. The Congress, the only party with a realistic chance of being part of a winning coalition in all the five elections, won only one, the least important politically, the Union Territory of Puducherry. In some manner, this man garnered more attention. Less than seven hours after a midnight landing in India, Apple CEO Tim Cook was spotted in a famous Hindu temple in Mumbai. He was seen there with Anant Ambani, son of Reliance Industries chairman Mukesh Ambani, whose Jio 4G service is expected to be a game-changer for mobile internet in India by the end of 2016. India was the sole bright spot in those results as Apple reported its first-ever revenue decline in 13 years. While global iPhone sales fell for the first time ever, a drop of 16% from the first quarter of 2015, they rose 56% in India in the same quarter. Mr Cook's visit to India is a first for an Apple CEO. None of the California-based technology giant's seven CEOs ever visited India while in office, though Steve Jobs famously came here as a backpacking hippie looking for "answers" in the mid-1970s. India accounts for just 1% of global iPhone sales and Apple's share of India's mobile handset sales is 1.5%. India's market is dominated by phones under 5,000 rupees, while Apple's recent models start at 39,000 rupees ($580; £390). 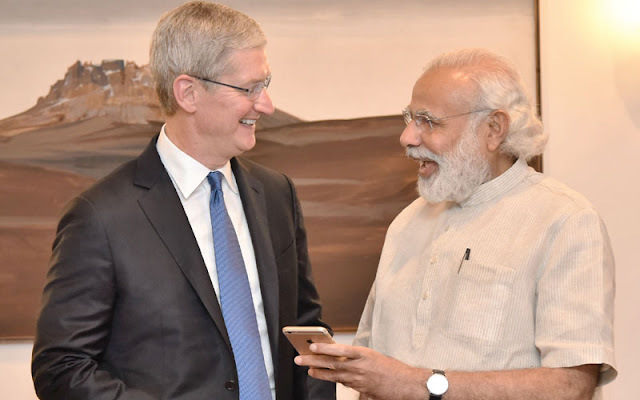 Expressing interest in making Apple products in India, the global technology giant’s chief Tim Cook on Saturday discussed with Prime Minister Narendra Modiji the “possibilities of manufacturing” and tapping the young talent pool in the country. On his maiden visit to India, the Apple CEO also discussed with Modi issues regarding cyber-security and data encryption. Cook has already announced during this trip setting of an app development centre in Bengaluru and one for maps in Hyderabad. During his meeting with Modiji, Cook highlighted the immense potential for app development in the country. He also narrated to the Prime Minister his experiences, including a visit to Siddhivinayak temple in Mumbai and watching a cricket match in Kanpur. Shri Narendra Modi, appreciating Cook, said that in India “seeing is believing” and added these experiences would definitely steer his business decisions. The California-based maker of iPhone and iPads plans to sell refurbished smartphones , though such proposals have been rejected twice. Moreover, the company also plans to set up its own retail outlets, and is seeking ease of local sourcing rules for it to set up shops here. Meanwhile, delegation members accompanying Apple CEO also spoke of their experiences in rural Rajasthan, where several villages have recently been electrified and women are being skilled to assemble and operate solar energy equipment. Cook should be a stranger to Cricket, more specifically the club league – IPL. 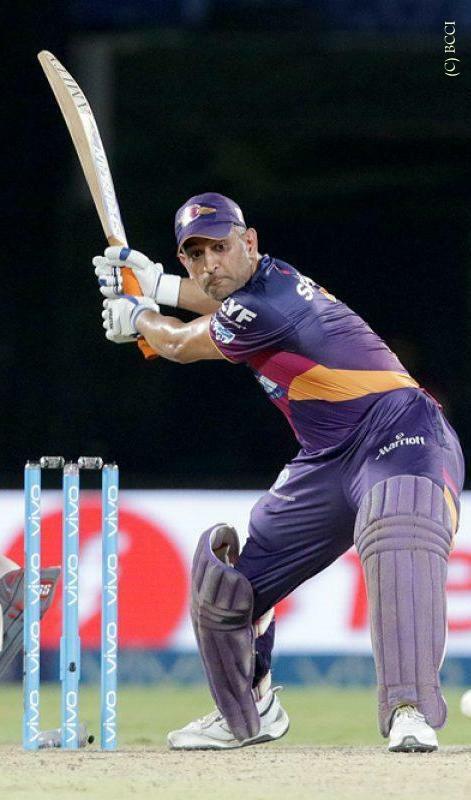 The Rising Pune Supergiants signed off their maiden season of the Indian Premier League with a thrilling 4-wicket win over Kings XI Punjab on Saturday evening. After KXIP had posted 172-7, RPS captain MS Dhoni produced a special effort, helping his team past the line off the last ball of the match. The win meant Rising Pune Supergiants finished 7th in the 8-team VIVO IPL standings, while Kings XI Punjab had to be content with the wooden spoon. Apple Inc CEO Tim Cook landed in Kanpur to get a taste of an IPL cricket match between Gujarat Lions and Kolkata Knight Riders, on invitation from League chairman Rajeev Shukla. During the first innings, Cook spoke to Alan Wilkins and said, “This is incredibly exciting, it’s my first cricket game. I’m hooked to it! The talent here in India is huge. We want to tap into the iOS ecosystem.” Lot is cooking ! A lot of excitement was evident at the Green Park Stadium which hosted an IPL game for the first time. It was also the first time that a game was played under lights here. Away, the Federation of International Cricketers Associations (FICA) has claimed that the Masters Cricket League, a private T20 tournament for retired cricketers held in Dubai and Sharjah earlier this year, has not paid "a significant number of players" according to their contractual agreements. The dishonouring of player contracts is an issue that the entire global game should address, but not an issue in IPL which draws crowds even for the deadest of dead rubbers. Two knocked-out teams - Rising Pune Supergiants and Kings XI Punjab - were desperate not to finish at the bottom of the pile. The final over began with Supergiants needing 23. M Vijay's key men in the end overs - Mohit Sharma and Sandeep Sharma - had bowled out. Axar was in the hot seat. It ultimately boiled down to 12 off the last two balls, with MS Dhoni, the supreme star, facing off against Axar Patel, the rising star. Dhoni unleashed his attacking avatar to bring back memories of his heyday; his back-to-back sixes over midwicket delivered Supergiants a sensational four-wicket win in Visakhapatnam.